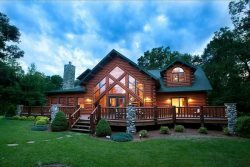 Surrounded by the beauty of a wooded hillside, this log home is located just two miles east of downtown Wisconsin Dells and accommodates 18 people comfortably. This spacious home contains a cozy great room, four bedrooms, 2 1/2 baths, wireless internet service and a full kitchen. Outside the home you will find a 2-sided deck with a grill. This home also has access to the Wilderness Resort water park. White tail is one of the best rentals sand county has to offer the waterpark passes that are included to the wilderness resort just tops all the other rentals. Amazing! We will return , hopefully this summer! Our interaction was great. Easy check in. See above Not only do we enjoy the property (whitetail ridge), the free night that they provide in the fall is very appreciated. THey generally run a buy 2, get 1 free night special in the fall. The cabin is always clean and in good order. Plenty of linens for extra beds and pillows. THe property is beautiful with great views of the river and forest. Ample parking, and great proximity to everything in WI dells. Check in is quick, as is check out. Team was friendly entire time except one call. Did have one agent get a little frustrated after asking a few questions. Overall, good. Great property, great location. The location of Whitetail is the perfect combination of private getaway while still offering the Dells experience. I have stayed at many resorts in the Dells and I enjoyed the Whitetail the best. The non working jacuzzi was the only big issue. Otherwise things such as the sound system and a gas grill would just be nice upgrades. Your team was amazing. From walking in to check in they gave me ideas on where to eat that night. It was a great stay! Met all of our expectations and more! Sand County team was great, I called a few days before our stay with some questions about the property and they answered them all very well. We had a fun and relaxing stay! My only problem with the cabin was that the loft area had (2) skylights and no way to cover them up while sleeping so we woke up kind of early (those who slept in that room). Overall it was a great vacation! Each year it is always a pleasure working with your staff. We have no complaints and are very thankful for the extra free night stay. Awesome time! Second time using Sand County Service Company and have had 0 issues. Team is very helpful and very knowledgeable on guiding the visitors. It was a very comfortable place for vacation because it is away from the city. We got to spend quality time with family and enjoy the averall cabin. everyone was very helpful and eager to help our group. Excellent, quick response and service. The Whitetail Ridge property is very nice with beautiful views of Wisconsin River. All the amenities were functioning properly. There wasn't enough kitchen utensils/plates for 15 people but luckily we brought our own disposable dishes/utensils. Coffee maker was broken when we tried to use it for the first time, but that issue was taken care of within two hours (the maintenance personnel brought new coffee maker). The garbage was picked up twice during our 4night stay which we would have preferred it was picked up after we left because my husband left a personal item on the porch which apparently was mistaken for garbage and was taken away during garbage removal. Overall experience was great. They were so nice! I thought the deposit was already taken care of and when I arrived I didn't have the entire cash down payment. I was freaking out, looking everywhere in my car for a check and didn't have anything on me. The lady told me not to worry and bring it back later.....she made my day!